It hadn’t been easy, to even appear on the start line was something of an achievement. In the 1980s, teams were invited to race at the behest of the Tour’s organisers, the UCI having little to no power over such matters. The Tour was proudly European, and some fans were confused as to why Team 7-Eleven had even been invited to attend. The US President of the time, Reagan, didn’t help the campaign to start the Tour – air strikes against Libya were seen as having the potential to cause unrest, with American citizens bearing the brunt of any anti-American feeling that had been stirred up. Team 7-Eleven called a halt to their race calendar in the early part of the year, fearing that as an American team and therefore a symbol of the US, the riders might be targets for angry reprisals. Nevertheless, the US team found itself on the start line of the 1986 Tour, which began in Boulogne-Billancourt with a 4.6km prologue. The prologue was won by a Frenchman, Thierry Marie. The race was off to an all-European start. Stage 2 saw Team 7-Eleven get tactical, when the Canadian rider Steida got into an early break and began chasing time bonuses on the road. By the end of the day, he had become the first North American to hold the yellow jersey. Team 7-Eleven’s selection appeared to be justified. A few hours after being handed the maillot jaune, Team 7-Eleven were handing it back. Immediately following Stage 2, on the same day, came Stage 3 – a Team Time Trial. Exhausted from their antics on the road, and perhaps showing their relative inexperience, the American team crashed early on, and then capitulated, dropping Steida in the process – clearly, defending yellow was a new notion. Not to be downhearted however, Team 7-Eleven were once again on top of the world after Stage 3, a 214km flat stage from Levallois-Perret to Liévan. Davis Phinney – father of current pro Taylor – was able to get himself into a small breakaway, and rode into the history books as the first ever American to win a road stage of the Tour de France. (Greg LeMond’s previous stage win had been in a Time Trial). Phinney was perhaps the last man to realise the significance of his ride however, as he was certain that the break he’d been riding with had failed to catch a solo rider who had gone off the front, and was completely unaware that he was in fact crossing the line as the stage winner. “It was a gradual uphill finish and I waited and jumped at about 300 meters to go, which was pretty long. I kind of took everybody by surprise because I was the first one to jump. So, even coming from the back, I got ahead of everybody and then the line just seemed like it took forever to get there…. I was so totally relaxed because we were only racing for second …I just chilled. Yesterday I successfully predicted a grand day out for Fabio Aru and Dan Martin, so the pressure is on today! Of the four wildcard entries into the 2017 Tour de France, only one comes from outside of France. The Wanty-Groupe Gobert team is based in Belgium, and makes its Grand Tour debut in the 104th edition of the Tour de France. Wanty-Groupe Gobert was founded in 2008 as the Continental level team Willems Verandas. The team took on its current name in 2014. The team currently rides at Pro Continental level, and were the only Pro Continental team to win a WorldTour one day race in 2016, with Enrico Gasparotto’s victory in the Amstel Gold Race. Wanty-Groupe Gobert have never ridden a Grand Tour, and each of the 9 selected riders is making his Tour debut. The Tour team features: Frederik Backaert, Thomas Degand, Guillaume Martin, Marco Minnaard, Yoann Offredo, Andrea Pasqualon, Dion Smith, Guillaume Van Keirsbulck, Pieter Vanspeybrouck. With todays stage finishing in Belgium, it seems fitting that a Belgian team ended the day as leaders of the team classification. Yoann Offredo was awarded the Most Combative Rider after his excellent ride in the two-man breakaway, which he rode with Cannondale-Drapac’s Taylor Phinney. “I studied the race book and immediately saw that an escape would leave early. When the break was formed, I wondered why I was in front. It was raining the whole day, but the feeling was good…some talked about a breakaway for publicity but that was not my main goal. In my mind there was something else. The stage victory.” Unfortunately for Offredo, the peloton caught the break with 1k to go. Speaking of Offredo’s ride, directeur sportif Hilaire Van der Schueren said “I am more than satisfied. This is the scenario we dreamed of! I saw the sponsors in tears…such days are not common”. Only two days in to the 2017 Tour and Wanty-Groupe Gobert already have much to be proud of! Mountain Bikes, Mud and Mid Wales – Welcome to the World of the ‘Dirty Weekend’! Photographs courtesy of Clive Powell. In Part 2 of our Mid Wales series, we talk to Clive Powell of Clive Powell Mountain Bikes based in Rhayader. Clive runs a bike shop offering rentals and a fantastic restaurant, perfect for hungry riders coming in after a long day in the saddle on one of the legendary ‘Dirty Weekends’ also on offer. The food is sourced locally and cooked by Francine, who also stocks up the support vehicle on nice days to assist with feeding the Dirty Weekenders mid ride! We stopped by for a chat with the man himself…..
Hi Clive, your cycle shop has gone from strength to strength and has become a real hot-spot for cyclists of all persuasions! What kicked it all off for you? I started my business in 1985 when I was 30 years old. At that time, I was working as a professional ski instructor in the winters, and filling in with building trade work in the summers. I had just given up my hobby of motocross racing, and was looking for something to replace the excitement and adrenalin that I used to get on race days. After a couple of years, I discovered mountain biking and I was immediately hooked. I took to it like a duck to water; the motocross gave me the technical skills, my taste for extreme physical effort gave me the desire, and I could see a way that I could earn a living in the summer working outdoors in the hills of Mid Wales. I bought some bikes and started off by doing half day guided mountain bike rides. From that pilot scheme I progressed to my legendary Dirty Weekends (fully packaged mountain bike weekends), eventually opening a shop in 1994 to support my activities. I got deeply involved in the sport, racing in mountain biking, cycle cross and a local Hilly Time Trial series which I organize myself. I have a few Welsh titles to my name, and hold some Hilly Time Trial records. Even though bad health meant that I was unable to ride my bike for 8 years, I still now participate in cyclocross races, and the Hilly Time Trial series. Clive’s shop in Rhayader – home to bikes, cakes, and the legendary Dirty Weekend! Currently my business is mostly shop-based. We sell bikes, we rent bikes, we repair bikes, and of course we ride bikes. On the bike I deliver road safety training in primary schools in Powys, and I am a coach for the Bulls Cycling Club based in Builth Wells. Apart from the Hilly Time Trials, I also run some winter mountain bike events. I am really lucky to live in an area that is so good for cycling; not just the fantastic backcountry biking on the bridleways and byways over the hills of Mid Wales, but also the endless opportunities for scenic and almost deserted roads. Even families can find places to ride – for example the Elan Valley Trail – a 9-mile traffic free route built on an old railway and running alongside the reservoirs of the Elan Valley. Our shop caters for all riders, not just the hard-as-old-boots backcountry riders, but also beginners and occasional riders, plus families, tourists, and of course riders who mostly get their adrenalin kicks at trail centres. We stock a wide range of models, mostly from Giant, but will also be taking on another exciting brand in the near future. We also have a fleet of hardtails for rent, plus hybrids for the Elan Valley Trail, and some electric bikes. The most popular service that we provide is the repair service. Our mechanic Neil, knows his stuff, is very thorough, and always has time for a good humoured chat with the customers. We have a number of routes off-road that are iconic and well known to the MTB fraternity, particularly the old school riders who were exploring the hills on bikes before the advent of trail centres. Mention the Golf Links or the Miner’s Trail to any grey haired mountain biker and watch their eyes light up! All of the routes around here are interestingly technical without being scary or dangerous. And the mud is mostly peaty, which is kind to your bike, and doesn’t stick to your tyres like the proverbial. Roadies find this a fantastic area to ride in with no less than 7 different roads leading away from Rhayader, and circular routes of as small as 7 miles. Mid Wales is, of course well known for it’s more epic routes such as the Devil’s Staircase and the Trans Cambrian. So, something for everyone on 2 wheels. The Welsh Cyclocross League has gone from strength to strength in recent years with up to 300 riders turning up to race every Sunday from Mid September to Christmas. The youngest riders catered for are the under 8s, and the oldest are the over 60s. Anyone who wants to give it a go can turn up and ride. A mountain bike will do, and entries are as little as £10 for an adult plus £3 for a day license. Events are held at different venues every week. Cyclocross is a great way to get into cycle racing. It is safe, but exciting and can be very technical. Most local bikers are just that:- bikers! they don’t categorize themselves as mountain bikers, roadies or whatever. Most of them do road, MTB, cross, time trials and have a stable of bikes. I mean, why limit yourself! People who may be unfamiliar with the area managed to catch a glimpse of Rhayader and surrounding area this year on the Tour of Britain TV coverage. What was it like seeing the action live? The stage through Wales was the hardest of the whole race, finishing at the Royal Welsh Showground in Builth Wells. It made a superb venue, with space for an exciting sprint finish, parking for spectators, trade stands, food, and a range of activities. First thing in the morning I rode in a sportive. I couldn’t believe just how excited I felt to finish on the actual finish-line of the Tour of Britain, and couldn’t resist doing a sprint for the final 100 metres! In between that and the race arriving, I delivered some mini sessions of road safety training to schoolchildren from the surrounding area, and got to watch the race come in from the roof of the Hospitality Suite. The sun shone and it was one of the most exciting days of the year for me. Events like the Tour of Britain, London 2012, and the Grand Depart of Le Tour in Yorkshire has really given British cycling a boost in recent years. Have you noticed the sport growing in popularity? Road racing, and the success of the British riders has done a lot for the sport in this country. It is difficult to assess how much has been due to our athletes, but I do now see kids bringing road bikes to school, and the number of women on the line at this year’s cyclocross races has more than doubled. What is your favourite piece of cycling kit? My favourite piece of kit is my cyclocross bike, which I built in 2002 and still race on now. It fits me like a glove and goes around corners like it’s on rails. Even if I get myself a more up to date bike sometime, I will still keep my trusty crosser. My ideal day on a bike locally is to compete in the Around the Dams time trial. It is a 17-mile course starting off with a 100ft climb the top of the mountain, followed by a winding route through the Elan Valley with no less than 9 technical corners. It is a proper test of bike riding ability, and riders come from all over to take part. There is always a great atmosphere and everyone gathers back at the shop afterwards for the results and coffee and home made cake. Thanks so much Clive, see you out-and-about on those trails soon no doubt! Freewheeling is moving up in the world – we now have an official logo! Back in October I got the colouring pens out one evening after a ride in Mid Wales. I was rather limited in terms of materials, however I sketched out a simple ‘F’ design, shaped to resemble drop handlebars and backed with part of a chain set. I happened to have a few gel pens to hand, enough to add some simple rainbow bands to match the World Champion’s jersey. The ‘F’ would be the main Freewheeling logo, however I did have a go at coming up with a design for the whole word. Unfortunately I ran out of space and got as far as ‘Freewheelin’, but the general idea was there for me to complete when I had more of my art materials with me. My first attempt at the main Freewheeling logo, using limited equipment in the hills of Mid Wales! The two attempted designs were not too bad, but I felt they needed tarting up a bit. I wanted to keep the personal feel of the hand-drawn logos, but they definitely needed to look a bit neater for a start….. So here we are….Introducing your Freewheeling OFFICAL logos! Thanks so much to Tom, these look great. Don’t forget to check out the Hafod Hardware website, where Tom has a Design tab showcasing some of the other logos and flyers he’s produced in the past. I’m sure he’d be only too happy to help anyone else out with a bit of creative artwork if you need him! All images courtesy of Hafod Hardware. In the first of our special series on cycling in Mid Wales, we caught up with the winners of Powys County Council’s Tour of Britain shop window competition – Hafod Hardware in Rhayader. Congratulation on winning the Powys County Council window display award, it really was well deserved. Where did you get the items which were on display? Firstly I’d like to say thank you for giving us the chance to talk about our shop and its window display. We take great pride in presenting our business to the highest calibre and when we heard about the competition for the Tour of Britain window displays, we knew we had to try and do something special. Immediately, my Grandfather, Alan Lewis, recommended that he should go over to the National Cycle Museum in Llandrindod to view the possibility of us borrowing one of the bikes to use in the display. Freda Davies at the museum was more than obliging and allowed us to borrow a limited edition Gold Plated 1987 Raleigh bike. This was to be the centre-piece in our display. They also lent us two cycling shirts that were worn and signed by previous competitors. Items on loan from the National Cycle Museum in Llandrindod Wells included past race jerseys and a limited edition Raleigh Centenary bicycle. What was your personal favourite display item and why? One of our favourite items in the display was the map of Wales. We cut a silhouette of Wales out of a sheet of ply wood and marked out the route of the Tour of Britain using pins and twine, kind of like the sort of thing you would see in old war movies. It would have been easy to print off an ordnance survey map and mark it out, but we wanted to keep the old style look to it and pay homage to the history of the race. How did the display come together? One of the first things we did was look around the shop and think ‘What items that we stock can we use and are relevant?’. Bike pumps, water bottles, sunglasses and head torches we all ‘musts’ and we had a few Union Jack flags lying around from our V-E Day window display. Less was more was our motto for this, and we didn’t want to take too much focus away from the bike. Just a few accessories were enough. How did customers react – did you have many people chatting to you about the display? Our customers loved it! As soon as we put photos up on social media, we had a wonderful reaction. Many people didn’t realise the race was taking place until they saw our window display. Many people popped their heads into the shop just to say how much they liked the display and a few even asked how much we wanted for the BIKE! I do the odd bit of cycling up the Elan Valley which is one of the most beautiful places in Britain. We are very lucky to have it on our doorstep and it is never taken for granted. My bike seems to have the most use though as a means of emergency transport. I am also a retained fire fighter for Mid and West Wales Fire and Rescue Service, so when my alerter goes, it’s straight on the bike and down the station as quick as possible. Did any of the other businesses in town mark the race in any way? Quite a few different businesses in town got involved in the competition in one way or another. The town set up a business group last year and the competition was advertised through the Business Group to encourage more people to take part. Our local arts organisation CARAD made a fantastic arts installation in the town and that also won the first prize in their category. Did you manage to see the riders coming through the town? Personally, I had to stay in the shop during the race, but that allowed for my Grandparents to go and watch the race. They took pictures and videos so I was able to get a feel of what was going on afterwards. Stage 4 of the 2016 Tour of Britain saw the riders cycle through Rhayader on their way to Builth Wells and the Royal Welsh Showground. What was the atmosphere like in the build up to the event, and how did the residents and businesses owners in Rhayader feel to have riders like Bradley Wiggins and Mark Cavendish visiting the area – if very briefly knowing the speeds they reach?! It’s always a spectacle. The town turns out in their crowds to support the riders and it brings a lot of people from the outskirts into the town for the day. Over the last few years we have had a bit of fun creating images using photoshop for different occasions such as Christmas, the Olympics and seasonal offers. It sparks a bit of interest on social media, and makes a few people smile who see the images in our shop window. Team Hafod on the road! What does the local area have to offer cyclists who might want to pay a visit after the Tour of Britain? Rhayader and The Elan Valley really is a cyclist’s paradise. The landscape makes for outstanding scenery and the amenities in the town offer everything you need. We have a fantastic cycle shop called ‘Clive Powell’s Mountain Bikes’ which offer guided cycle excursions, and the number of pubs and accommodation providers in town make for a cracking cycling break in Mid-Wales. Can you explain a little of the history of your shop, and your role – both the creative side with local posters, logos and flyers as well as the hardware shop side of things? Hafod Hardware first opened it’s doors in 1895. Built specifically as and Ironmongers you can tell straight away the shop would be had pressed to trade as anything but. The shop was owned and run by a gentleman called R.D. Ryder, who was a cousin for my Grandfather, for the majority of its time. My Grandparents, Alan and Pauline Lewis, then bought the business in 1999, reverting it back into the family. I started working in the shop in 2009 after studying Art and Design in Newport University. My first task was to set up an online presence for the shop, creating a website and social media pages. I think in this day and age this is a must as it allows you to reach far more customers and makes marketing to the masses much more manageable. The quieter winter months also allow for me to incorporate my art projects into the business. This season our series of vintage style tourism poster have sold particularly well and we are getting more requests for other local town and villages by the day. As well as being your local DIY store we now offer a range of original pieces from other local partners. We sell ornate pieces from the local forge as well as walking boots from another local trader. Working alongside other local businesses is becoming a great way for smaller towns to market themselves and work together in a time of austerity. We want to be at the forefront of that idea and set a precedence. We will always hold true to the nature of our business whilst being forward thinking in how we can diversify in a changing market. Alan and Pauline Lewis with Tom Jones of Hafod Hardware take on Open All Hours! Don’t forget to visit www.hafodhardware.com and www.facebook.com/hafodhardware to check out more from Tom, Alan and Pauline! Find out more about the National Cycle Museum here – www.cyclemuseum.org.uk – we’ll be featuring the museum soon as part of our Mid Wales series. Here at Freewheeling we love seeing the up-and-coming riders progressing through the ranks and taking big wins. This year Pete Kibble, riding in the Welsh team jersey, won a fantastic second stage of the Junior Tour of Wales atop Rhigos mountain after a gruelling route packed with climbs and traditional Welsh weather! To make it all the sweeter, it just happened to be his last stage race on UK soil as a junior. Next season, Kibble will be riding with Zappi Pro Cycling at U23 level, after recently signing a new contract. We caught up with Pete to hear all about his hopes for the 2017 season and beyond…. Congratulation on signing with Zappi Pro Cycling! How did that come about? Getting a ride with Zappi’s came from having a conversation with Flavio Zappi at the Ras de Cymru in Wales. We kept in touch since then and he asked if I would like a ride in the summer. It was a hard decision as I also had an offer from a UK team but I weighed it up and felt as though I would develop more by racing on the Continent in tougher UCI races. It’s the entire lifestyle I’m looking at, living abroad, learning to speak Italian; not just the racing. What was the highlight of your 2016 season? The highlight of my year was winning the Junior Tour of Wales Stage 2 up Rhigos mountain, definitely. This was my first real big win and to do it on home soil, at my favourite race, just topped it off. I had a few other highlights but this race really topped it off for me. How have you changed as a rider over the last 12 months? Was there anything specific that you were working to improve? I wouldn’t say I have changed as a rider style-wise over the last 12 months, but I have progressed tactically, learning how to race better. I would say my biggest improvement came in TT’s this year, knocking my PB down from a 20:40 to a 19:15 and placing highly in most open TT’s I did. What are your hopes for the 2017 season? My aims for the upcoming season are to continue learning, and to put in place the building blocks of experience for my career. It will be a big learning curve and the racing will be a whole new experience. It’s also a big step up into U23s, but I aim to get some top 20 results once I get into the style of racing. ‘I don’t use power meters at the moment – I just go on feel and heart rate’ Photo courtesy of Pete Kibble. Describe your riding style – do you go for sprint wins, TTs, mountain stages or GC? My style is definitely suited to racing for GC. I’m a good climber and I like tough terrain. I haven’t got a great sprint so I like races where the terrain dictates the way in which the race will be won. I also like time trials and I do a lot of them. Which do you prefer, one-day races or stage races? I definitely prefer stage racing to one day races as it suits my style of riding a lot more; it’s about being consistent which I feel is a strength of mine. One day races are usually decided in a sprint which isn’t my forte. Who is your favourite rider in the current pro peloton? My favourite rider has to be Tom Boonen – he’s just uber cool and is an incredible tactician. I mean it takes a hell of a rider to win Paris Roubaix 4 times! Which cyclist would you say has inspired you the most? Most inspirational cyclist for me has be Chris Froome. He seems like the most unlikely person to win the Tour de France looking at his background and where he’s come from. He just lets his legs do the talking and has become incredibly successful, winning the Tour 3 times which is phenomenal. 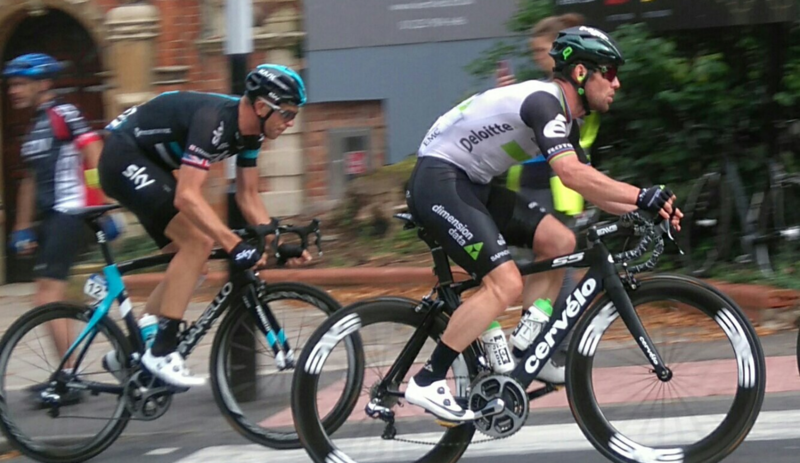 Did you manage to get to the road-side to watch any of the Tour of Britain stages this year? I watched this year’s Tour of Britain in the Cotswolds on Dursley hill. It was great to see so many spectators and people really embracing the race. We notice that you’ve started a blog – how are you finding the writing and blogging side of things? I enjoy writing the blog as it’s something new. It’s good to do as a distraction from training, it will get a lot better when I’m away racing during the season when I have so many new experiences to write about! What is your favourite bit of cycle kit – what could you not ride without? Stephen Roche feels that race radios and power meters are making racing less exciting, what do you think about such new technology? With regards to Stephen Roche’s views, I can understand where he’s coming from as there is a lot of data that affects the way races are won – riders become very calculated. In that respect it definitely could be more exciting without the use of so much technology. However there are a lot of plus points with regards to rider safety with the use of radios. Power meters are a really good training tool, and I don’t think a lot of riders will take a lot of notice of their figures during a race. Personally I don’t use power at the moment I just go on feel and heart rate. Sagan will be riding in the Rainbow stripes for another year after his win in Doha. If you could only win ONE of cycling’s most prestigious jerseys, which one would you choose and why? My favourite jersey to win would have to be the yellow at the Tour de France. It’s the most prestigious race in cycling and it’s such a large human endeavour to win it. It takes so much to get a result at the Tour de France as it’s 3 weeks of full on racing, and there are so many variables you have to be such a rounded rider and have fantastic support to succeed. Good luck Pete – we wish you all the best! Here at Freewheeling, we have a bit of a confession to make…a shocking revelation in fact. So here goes, I’ll share it with you. I, your cycle correspondent of the blogosphere, regularly break The Rules. Specifically, Rule #22 – Cycling Caps are for Cycling. This obviously means I’ll never be accepted as a true member of the Velominati, but that’s the price you pay when you love a good cap. Caps Not Hats indeed. If it’s a stylish cap you’re after, then look no further than Walz Caps. Handmade in the USA, Walz have a cap to suit everyone, from woollen tweed, perfect for that Eroica ride, to the ‘Map Caps’ range, where you can show off your allegiance to a host of American states or European cycling hot-beds like Belgium or Italy. And if that hasn’t piqued your interest how about this – that cap you’ve created in your imagination, that design you’ve been doodling in your mind’s eye? Well Walz have it ready to send to you – just log on to http://www.walzcaps.com, click ‘Custom Caps’, and get creating. Yep, that’s right – you can create your very own one-off cycling cap. What could be better than that? We spoke to Matt, Customs and Wholesale Director of Walz Caps to find out all about the Classic American Cap…Read the interview below! Describe your role in the company…Currently, my role is Customs/Wholesale Director, which involves inside sales, production, and design. How did the company start, and what was the vision for Walz in the beginning? The company officially began in 2005 as Walz Caps. Unofficially, it began with the owner’s aunt, Jackie Walz, who used to sew up welding caps for her husband and his co-workers. One day a friend and cyclist, saw the caps and asked if she would tweak the design a bit and make something more cycling-specific for him. She did, and did it so well that word began to spread, and the demand for her “cycling” caps grew. Her nephew and now the owner of the company, saw that she needed help and offered to purchase the cycling side of the operation from here, and decided to name the company in her honor…Walz Caps was born. Your designs manage to be both fresh, new and exciting, yet fit in with the stylish side of the cycling tradition, how does Walz manage to blend both these features in to the designs? While we are continually striving to come up with bold, fresh, and exciting designs, we always keep in mind the tradition and heritage that is the foundation for the sport of cycling, and particularly the role that cycling caps have played in that. Some caps, such as our classic cottons and our ever-popular wools, don’t need to be flashy…they speak for themselves. Where does the inspiration for the Walz designs come from? It’s truly a team effort. Anyone and everyone within the company is always welcome to throw new ideas out there. Some stick, some don’t, but no one person is in charge of product development, it’s a company-wide collaboration. We also receive numerous ideas from our customers, some of which have ignited the creative spark that’s needed to come up some great designs throughout the years. How do you source the right fabrics? We work to locate suppliers we believe are the best at what they do. Our caps begin as raw material, and if that material isn’t the best, there’s no way our caps can be. And as a company who prides itself on making everything in-house, by hand, and 100% made in the US, we seek vendors and suppliers who are located and manufacture in the US as well. That’s extremely important to us, and we’ve been pleased over the years to hear how important that is to a large portion of our customer base. Describe the Walz ethos and aesthetic….Pride in what we do at all levels. The moment an individual visits our site, contacts us by phone or email, or stops in to pay us a visit, our goal is to make sure that their experience with us is nothing short of exceptional. Of course that experience applies to our products, after all, that’s why people contact us in the first place, but as cliche as it sounds, it’s the relationships that we build over the years that matter most to us. Nothing makes our day more than hearing from our customers how satisfied they’ve been with not only our caps, but our service. We want people to feel as though they belong to the Walz family, that they’re a part of what we’re doing. How are the caps made and how long does it take to make one? Our caps start out as a roll of material. From there, they’re cut by hand, sewn by hand, QC’d by hand, boxed and shipped by hand. As you’ve noticed, I’m stressing the fact that every single cap we make is carefully crafted by actual people who specialize in their roles here. If I had to put a time on how long it takes to make a single cap from cutting, sewing, and passing QC, all uninterrupted of course!…10 minutes. The ability for customers to design their own caps is really unique. Do you ever come across some really ‘out there’ customer designs? Similarly, have there ever been any ideas, either customer-designed or Walz designed, that just haven’t worked in practice? I couldn’t list all of those in this interview, and keep it PG-rated at the same time! Most of our customers designs are incredible, and there have been many that have caused some envy with our designers. We always make any design that a customers wants, but we do provide input when we believe that a design may not provide the end result a customer is seeking. Have there been any ideas that haven’t worked in practice? I’ve never kept track, but many for sure. Personally, I don’t believe that there’s such thing as a bad design, some just work better than others, and more often than not, you don’t really know until you have an actual physical sample in-hand. We’ve created designs that look absolutely beautiful on a monitor, look great after they’ve been printed, and then look nothing like what we were expecting. If it didn’t work, take notes of what needs to be altered, and try it again, and keep trying until you get what you’re after. What can Walz fans look forward to in the future? We just launched a new line of caps, a total makeover of our older line. Our entire line of wool cycling caps now feature a fully lined interior, as well as our entire line of Velo/City caps. Our recently launched Build-a-Cap program has been so well received that every day is a challenge to keep up with the demand. And as always, new designs are in the works, that’s something that will never change around here. Thanks for taking an interest in what we’re doing, we truly appreciate it!